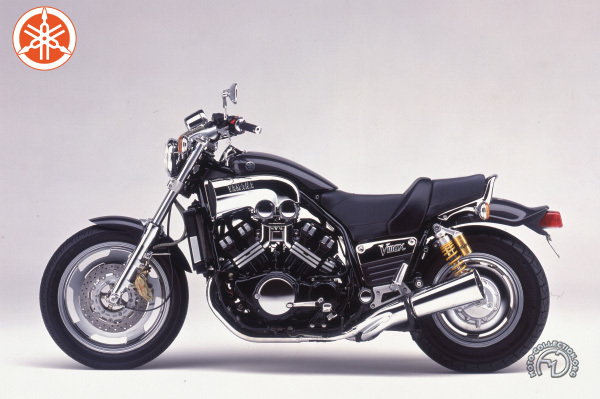 "The Yamaha V-Max was originally designed for the United States, though it achieved surprising success when it was imported to France in 1986. It immediately became the favorite bike of the rich and famous along the Côte d'Azur. Style is what the V-Max is all about, with its huge aluminum air scoops feeding its quadruple carburetors and its instruments mounted atop its gas tank. It looks dangerous while retaining a high-class appearance. An "urban dragster," the V-Max combines a wide range of apparently incompatible qualities. A massive machine with a totally-exposed 1200cc V power unit crammed into its double-cradle frame, the V-Max leaps away from traffic signals with a satisfying squeal from its fat rear tire. But it's also a refined street cruiser with astounding fifth-speed flexibility at low revolutions. Further evidence that the V-Max is a gentle giant: even at full bore, the rumble of its two huge chromed tail pipes is far from ear-splitting. In these days of low overall speed limits, the VMax has created a new style of superbike, a real leisure machine whose raw power is tamed by all the finesse that modern engineering can provide.